Christine Mix was born in Dayton Ohio, in the early 1960’s. In the mid 1970’s, her family moved to Connecticut, where her father was raised, just outside of New York City. She drew and painted, played with clay, wrote poems and stories, as a child and continued on through college. As a young adult, Christine was lucky enough to visit England with her sister and a couple of years later, India, with friends. 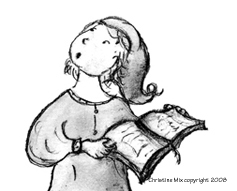 Christine studied art at Coker College, in Hartsville, S.C. for one year and then headed to Florida, where she received an Art Scholarship for painting, at Hillsborough Community College in Tampa. While at college, she also studied sculpture, photography, cinematography and theater arts. It was just after she graduated from the University of South Florida in 1988, with a B.A. in Fine Arts and another B.A. in Mass Communications, that she painted her first children’s illustration in watercolor, titled “Spike & Wordo’s Magical Wish.” Hence, Spike the Dragon was born and Christine realized she had found her niche in art and her future! Christine happily lives in Vermont, with a few pets, and her other half, Jake. 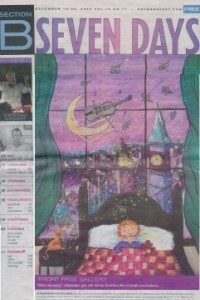 She has been painting children’s illustrations ever since Spike was originally created. 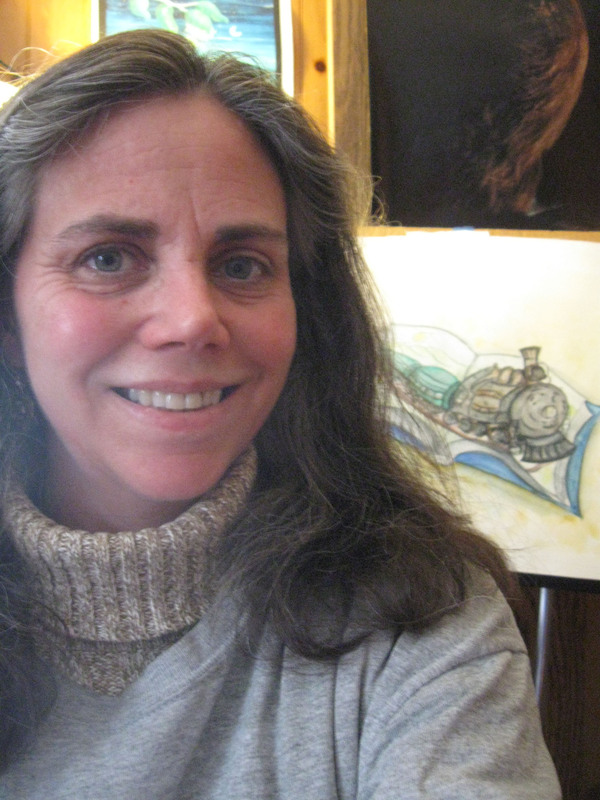 She’s also been painting for theaters and interior decorators, private commissions, showing and selling her original illustrations, prints, greeting cards and other gift items through galleries, art shows and designers, in Florida and Vermont, for the last 27 plus, years. 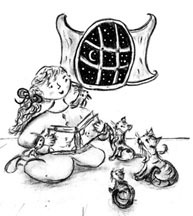 Her illustrations, have been exhibited at the Chaffee Art Center’s, When the Wind Bears Go Dancing, an Exhibit of Children’s Book Illustrations, 2010, Winter and Autumn Member shows, 2011 and 2013, Rutland, Vt., Tilbury House Publisher’s One of Us / Powered by Girl Exhibit, at the Book Culture, NYC, for the Book Expo America, 2010, as well as, the Southern Vermont Center, South Londonderry Free Library, Mary Canfield Free Library, the Dorset Library, 2000-2009 and the Middlebury Arts Walk, 2010 – 2014. In 2015, her illustrations have been exhibited at The Master Story Teller’s Exhibit, (CBIG), Poe Park Museum, in Poe Park, Bronx, NY., the Fairytales Exhibit (CBIG) at the Brooklyn Library, Brooklyn, N.Y. and the Fur & Feather Exhibit at the Great Hall, in Springfield, Vt.
Front Page Gallery, Dec. 15-22, 2004. 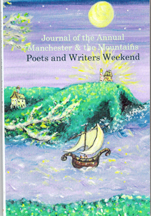 Her illustration, Twilight Magic, also appeared as cover art for Journal of t he Annual Manchester & the Mountains Poets and Writers Weekend, Shires Press, Manchester, Vt., May, 2009, (below). and so far, one children’s book, Write Out of the Oven! Write Out of the Oven! personally connects children in grades 5-8 with their favorite literary heroes! 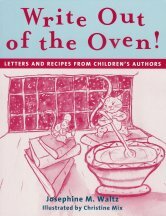 A collection of letters and recipes from more than 50 well-known and award-winning children’s authors provide insights into their lives, advice to the children who wrote to them, and personal information. Each entry includes the student’s letter to the author, the author’s response, and a recipe from the author. 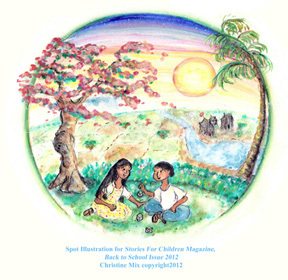 A portion of the proceeds from the sale of this book goes to a children’s literacy foundation. Chicken Soup for the Child’s Soul Character-Building Stories to Read with Kids Ages 5-8, May 2007. For more information visit www.chickensoup.com for book ordering details. Chicken Soup for the Child’s Soul and Write Out of the Oven! Christine is also listed on the New England Foundation’s Creative Ground site! and the VAC’s link for grant guidelines for schools and arts organizations.